Lucy, like many northerners, was steeped in the ideologies of abolitionism early on. She was inspired by the writings of Sarah and Angelina Grimke, early abolitionists and also proponents of women's rights. She quickly committed herself to a similar path, to fight for human rights. She was the clearest, truest voice of the suffrage movement, which finally, after decades of effort, turned the tide for women's rights. However, like the trees obscuring the cellar walls of her childhood home, the tales of less influential suffragists grew to overshadow her story. Save for a small plaque hanging in the Massachusetts State House, Lucy Stone was nearly lost to us. So perhaps it had to be this way: much like Lucy's lifelong struggle to advance the rights of women, the fight to preserve her homesite was a battle of wills. Charlie Wyman spent eight years–more than half his career with the Trustees–piecing together a jigsaw puzzle of landowners, government agencies, and state and federal dollars. "In my career this project ranks in the top two or three in terms of complexity," says Wyman, who recently took a similar position with the Massachusetts Audubon Society. "I didn't know Lucy Stone from Sharon Stone when this started. This has been a great education for me; she was an extraordinary woman in extra-ordinary times. But there were so many times I was sure this project wouldn't come together, so many times I was tempted to walk away." The journey that led him to cross paths with Lucy began in Ohio. "I was already an environmentalist, but I matured as one at Oberlin," says Wyman, who majored in biology. He studied natural resources and planning at the graduate level at the University of Michigan and held several environmental jobs before returning to New England. For four years he worked for the town of Lexington, Massachusetts, staffing its conservation commission. "I realized I wasn't suited to regulations, to being a ‘cop,' but I loved the preservation work," he says. When Wyman joined the Trustees of Reservations–the oldest land trust in America, protector of more than 50,000 acres in Massachusetts–he couldn't know he would contribute to one of the most productive periods in the organization's 113-year history. The Coy's Hill project started out like most, with one of the landowners contacting the Trustees. The parcel in question–367 prime acres with frontage on a state road, ripe for development–was owned by several family members. Staff members evaluated the land and realized immediately that it dovetailed on several fronts with the Trustees' mission: to preserve, for public use and enjoyment, properties of exceptional scenic, historic, and ecological value in Massachusetts. 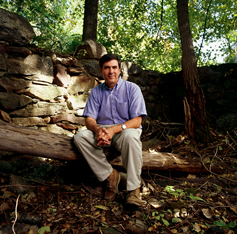 Charlie Wyman '75 is working to preserve this childhood homesite of Lucy Stone, Class of 1847. "It was worth saving because of the Lucy Stone connection, but also for its ecological value," says Wyman. The remnants of the homestead, which was destroyed by fire in 1950, and the hillsides now covered in mature forest "illustrate forest succession and the changing role of agriculture in New England," he explains. As part of a larger corridor of protected lands, the site would accommodate plants and animals that favor deep, contiguous forest. Even though the land was being offered at a bargain price, the Trustees still needed to raise considerable funds for the purchase. Though Wyman proposed many scenarios, the family and the funding never quite matched. "If I've learned anything in this business, it's that people care very much about their land…and that family dynamics are complicated," says Wyman. But in the fall of 2001 the planets aligned. "A brief window of opportunity opened for some funding on the state level," remembers Wyman. "After more months of juggling, we bought the 367 acres and immediately resold 306 acres to the state fisheries and wildlife agency. The town provided critical help by purchasing the development rights on the remaining property, including the homesite, thanks in part to an additional state grant. I can't tell you the number of times this project hung in the balance," he says, his eyes wide with residual disbelief. "But somehow we did it."